Over the past decade, business intelligence has been revolutionized. Data exploded, and became big. We all gained access to the cloud. Spreadsheets finally took a backseat to actionable and insightful data visualizations and interactive business dashboards. The rise of self-service analytics democratized the data product chain. Suddenly advanced analytics wasn’t just for the analysts. 2018 was a particularly major year for the business intelligence industry. The trends we presented last year will continue to play out through 2019. But the BI landscape is evolving and the future of business intelligence is played now, with emerging trends to keep an eye on. In 2019, business intelligence strategies will become increasingly customized. Businesses of all sizes are no longer asking if they need increased access to business intelligence analytics but what is the best BI solution for their specific business. Companies are no longer wondering if data visualizations improve analyses but what is the best way to tell each data-story. 2019 will be the year of data quality management and data discovery: clean and secure data combined with a simple and powerful presentation. It will also be a year of multi-cloud strategies and artificial intelligence. We are excited to see what this new year will bring. Read on to see our top 10 business intelligence trends for 2019! Exclusive Bonus Content: Get Our 2019 BI Trends Handbook For Free! Share the essential business intelligence trends among your team! The analytics trends in data quality grew greatly this past year. The development of business intelligence to analyze and extract value from the countless sources of data that we gather at a high scale, brought alongside a bunch of errors and low-quality reports: the disparity of data sources and data types added some more complexity to the data integration process. A survey conducted by the Business Application Research Center stated the Data quality management as the most important trend in 2019. It is not only important to gather as much information possible, but the quality and the context in which data is being used and interpreted serves as the main focus for the future of business intelligence. Accordingly, the rise of master data management is becoming a key priority in the business intelligence strategy of a company. Today, most companies understand the impact of data quality on analysis and further decision-making process and hence choose to implement a Data Quality Management (DQM) policy, department, or techniques. DQM is indeed reckoned as the key factor to an efficient data analysis, as it is the basis from where all the rest starts from. According to Gartner, poor data quality is estimated to cost organizations an average of $15 million per year in losses. The consequences of bad data quality are numerous; from the accuracy of understanding your customers to constructing the right business decisions. That’s why it is of utmost importance to start with utilizing the right Key Performance Indicators – there are numerous KPI examples that can make or break the quality process of data management. DQM consists of acquiring the data, implementing advanced data processes, distributing the data effectively and managing oversight data. We detailed the benefits and costs of good or bad quality data in our previous article on data quality management, where you can read the five important pillars to follow. Data Quality Management is not only uprising in the BI trends 2019, but also growing to a crucial practice to adopt by companies for the sake of their initial investments. Meeting strict data quality levels also meets the standards of recent compliance regulations and demands. By implementing company-wide data quality processes, organizations improve their ability to leverage business intelligence and gain thus a competitive advantage that allows them to maximize their returns on BI investment. Data discovery has increased its impact in the last year. The already mentioned survey conducted by the Business Application Research Center listed data discovery in the top 3 business intelligence trends by the importance hierarchy. BI practitioners steadily show that the empowerment of business users is a strong and consistent trend. 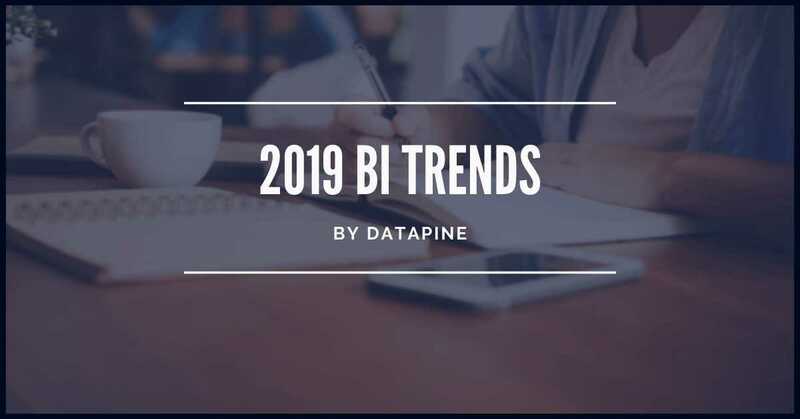 Since humans process visual data better, the data discovery trend will find increment as one of the most important BI trends in 2019. This is one of the major trends chosen by Gartner in their 2019 Strategic Technology Trends report, combining AI with autonomous things, and concentrating on the level of sophistication AI interacts with its environment. 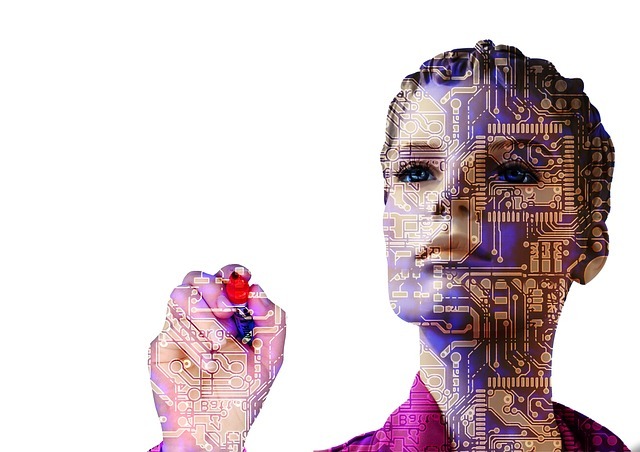 Artificial intelligence (AI) is the science aiming to make machines execute what is usually done by complex human intelligence. Often seen as the highest foe-friend of the human race in movies (Skynet in Terminator, The Machines of Matrix or the Master Control Program of Tron), AI is not yet on the verge to destroy us, in spite the legit warnings of some reputed scientists and tech-entrepreneurs. While we work on programs to avoid such inconvenience, AI and machine learning are revolutionizing the way we interact with our analytics and data management. The fact is that it will affect our lives, whether we like it or not. We are evolving from static, passive reports of things that have already happened to proactive analytics with live dashboards helping businesses to see what is happening at every second and give alerts when something is not how it should be. Our solution at datapine includes an AI algorithm based on the most advanced neural networks, providing a high accuracy in anomaly detection as it learns from historical trends and patterns. That way, any unexpected event will be notified and will send you an alert. We have also developed a new feature called Insights, also AI-based, that fully analyzes your dataset automatically without needing an effort on your end. You simply choose the data source you want to analyze and the column/variable (for instance, Revenue) that our decision support system software should focus on. Then, calculations will be run and come back to you with growth/trends/forecast, value driver, key segments correlations, anomalies, and a what-if analysis. That is an incredible time gain as what is usually handled by a data scientist will be performed by a tool, providing business users with access to high-quality insights and a better understanding of their information, even without a strong IT background. 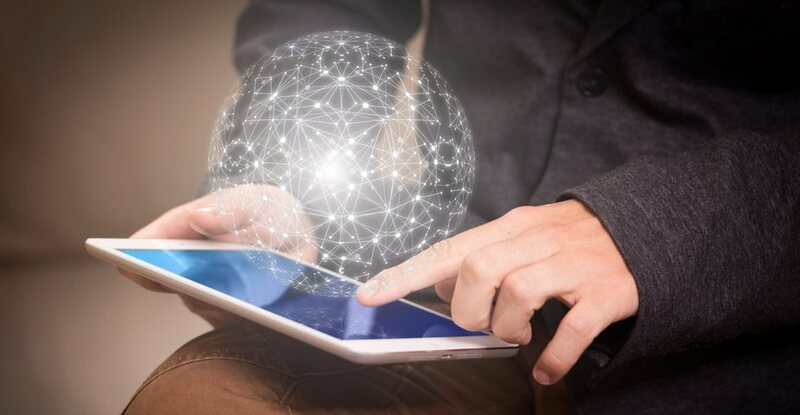 The demand for real-time data analysis tools is increasing and the arrival of the IoT (Internet of Things) is also bringing an uncountable amount of data, which will promote the statistical analysis and management at the top of the priorities list. However, businesses today want to go further and predictive analytics is another trend to be closely monitored. Another increasing factor in the future of business intelligence is testing AI in a duel. To illustrate, one AI will create a realistic image, and the other will try to determine whether the image is artificial or not. This concept is called generative adversarial networks (GANs) and can be used in online verification processes, like the CAPTCHA technology. When the dueling happens several times, the AI can become smarter to evaluate and break that kind of online security systems. Tech giants, like Alibaba, uses AI in many different ways that will alternate the machine learning process and we should keep an eye on this process in 2019.
Business analytics of tomorrow is focused on the future and tries to answer the questions: what will happen? How can we make it happen? Accordingly, predictive and prescriptive analytics are by far the most discussed analytics trends among the BI professionals, especially since big data is becoming the main focus of analytics processes that is being leveraged not just by big enterprises, but small and medium-sized businesses alike. Predictive analytics is the practice of extracting information from existing data sets in order to forecast future probabilities. It’s an extension of data mining which refers only to past data. Predictive analytics includes estimated future data and therefore always includes the possibility of errors from its definition. Predictive analytics indicates what might happen in the future with an acceptable level of reliability, including a few alternative scenarios and risk assessment. Applied to business, predictive analytics is used to analyze current data and historical facts in order to better understand customers, products, and partners and to identify potential risks and opportunities for a company. Industries harness predictive analytics in different ways. Airlines use it to decide how many tickets to sell at each price for a flight. Hotels try to predict the number of guests they can expect on any given night in order to adjust prices to maximize occupancy and increase revenue. Marketers determine customer responses or purchases and set up cross-sell opportunities, whereas bankers use it to generate a credit score – the number generated by a predictive model that incorporates all of the data relevant to a person’s creditworthiness. There are plenty of big data examples used in real life, shaping our world, be it in the buying experience or managing customers’ data. Among different predictive analytics methods, two are quite popular among the Data scientists: Artificial Neural Networks (ANN) and Autoregressive Integrated Moving Average (ARIMA). In Artificial Neural Networks data is being processed in a similar way like in biological neurons. Technology duplicates biology: information flows into the mathematical neuron, is processed by it and the results flow out. This single process becomes a mathematical formula that is repeated multiple times. As in the human brain, the power of neural networks lies in their capability to connect sets of neurons together in layers and create a multidimensional network. The input to the second layer is from the output of the first layer, and the situation repeats itself with every layer. This procedure allows for capturing associations or discovering regularities within a set of patterns with the considerable volume, number of variables or diversity of the data. ARIMA is a model used for time series analysis that applies data from the past to model the existing data and make predictions about the future. The analysis includes inspection of the autocorrelations – comparing how the current data values depend on past values – especially choosing how many steps into the past should be taken into consideration when making predictions. Each part of ARIMA takes care of different side of model creation – autoregressive part (AR) tries to estimate current value by considering the previous one. Any difference between predicted data and real value are used by the moving average (MA) part. We can check if these values are normal, random and stationary – with constant variation. Any deviations in these points can bring insight into the data series behavior, predicting new anomalies or helping to discover underlying patterns not visible by bare eye. ARIMA techniques are complex and drawing conclusions from the results may not be as straightforward as for more basic statistical analysis approaches. But once the basic principles are grasped, the ARIMA provides a very powerful tool for predictive analysis. Prescriptive analytics goes a step further into the future. It examines data or content to determine what decisions should be made and which steps taken to achieve an intended goal. It is characterized by techniques such as graph analysis, simulation, complex event processing, neural networks, recommendation engines, heuristics, and machine learning. Prescriptive analytics tries to see what the effect of future decisions will be in order to adjust the decisions before they are actually made. This improves decision-making a lot, as future outcomes are taken into consideration in the prediction. Prescriptive analytics can help you optimize scheduling, production, inventory, and supply chain design to deliver what your customers want in the most optimized way. The ubiquity of the cloud is nothing new for anybody who stays up-to-date with BI trends. In 2019 the cloud will continue its reign with more and more companies moving towards it as a result of the proliferation of cloud-based tools available on the market. Moreover, entrepreneurs will learn how to embrace the power of cloud analytics, where most of the elements – data sources, data models, processing applications, computing power, analytic models and data storage – are located in the cloud. There are more and more organizations moving their data and all of their applications to the cloud. Gartner states that by 2019, the cloud will be the common strategy for 70% of the companies – while it was less than 10% in 2016. When evaluating the hosting environment, you take risk, speed, costs, and complexity into account, which makes it even harder to pick one solution fitting all your needs. Opting for a multi-cloud strategy is then an option as it reduces risk and provides more flexibility – but such flexibility comes with certain costs, as you need several providers as well as training your teams to learn multiple platforms. Besides, you decrease your discount potential buy buying more, in a smaller quantity, and thus at a higher price. This is why multi-cloud is a debatable choice within companies, even though its adoption is clearly on the rise. Business will need to assess their needs and capacities of implementation, to evaluate whether it would be beneficial and profitable to go for a multi-cloud strategy. That being said, using multi clouds is becoming an increasing part of the BI strategy of a company, and giants like Alibaba, Amazon, Google, and Microsoft all turned attention in developing these growing business intelligence market trends. The connected cloud will be a big topic in 2019, and we should keep a close look where it will take us. According to the DGI (Data Governance Institute), data governance is “the exercise of decision-making and authority for data-related matters.” In other words, it is the control over any data entry that has to be made accordingly to particular standards. In 2019, organizations will increase the focus on data governance and data quality. As data is only useful when accessible, organizations will increasingly look to strike a balance between data access and security. They also must learn to remain agile and adapt as the business changes. New data preparation tools and methods will help fuel this trend and decrease the cultural gap between business and technology. Organizations are learning that data governance can help nurture a culture of analytics and meet business needs. Also, people are more likely to dig into their data when they have centralized, clean, and fast data sources. The rush to implement self-service business intelligence capabilities has led to major Excel-like governance issues for a lot of organizations. In 2019, organizations will look to reinstate trust and reliability back into analytics practices. More collaborative processes will be created to help both IT teams and end-users agree and implement modern data governance models, maximizing the business value of analytics while not jeopardizing security. We have witnessed data breaches that have created a rise in security questions about governance and trust. In order to improve business outcomes, organizations have started to view data governance as a necessity, but the lack of experience creates challenges into implementing and combining data quality, risk, ethics, privacy, and security to drive reliable business values, according to Gartner. Related to Governance and Trust, security is, without a doubt, one of the biggest business intelligence trends in the last years. The news seems to be filled with reports of data breaches and database security issues, including huge data losses by big brands such AOL, MySpace, Compass Bank, AT&T, NHS, LinkedIn, Apple, JP Morgan Chase, or Uber. While the big companies make the news, concerns are also being raised over the vulnerability of small businesses. Database security has become a heated debate, both in the public and in private organizations. This will only pick up speed in 2019. Business owners will increasingly search for the most secure solution that averts the risk of data breach and losses. In this context, a usually hot debate is the decision between on-premises or cloud BI tools: whether the software is installed locally in the company’s own servers, or if the solution is hosted in the cloud. 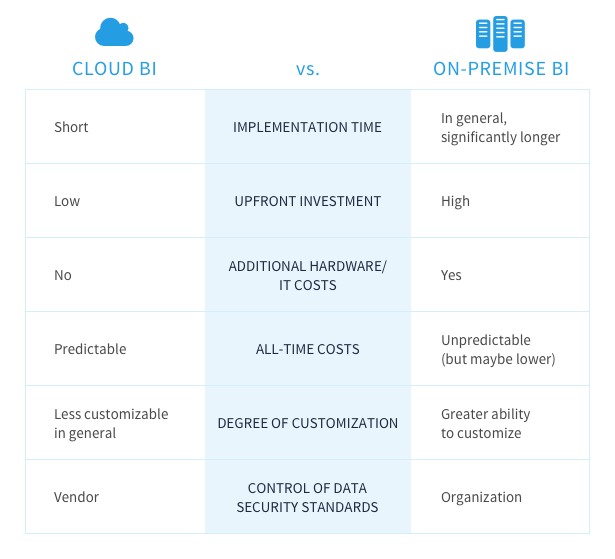 At datapine, we support both options and provide an analysis of the cloud vs on premise comparison, which can be summarized with the chart below. Another crucial element to consider is the consumers’ growing awareness of the value their personal information has, and how it is been used by private and public entities. After Facebook has witnessed the biggest data breach in which 50 million accounts were compromised, rumors spread that Google tracked Mastercard’s users’ buying habits – these controversies made consumers more aware of their personal information and online habits. We can safely affirm that today, data and analytics are getting to the core of every business. Every company has had a Chief Information Officer who supervised all the information management assets and security issues. But today, the data and analytics volume and role are getting so big that a new position emerged: the CDO, or Chief Data Officer, and CAO, or Chief Analytics Officer. Today, their role has increased and they have one of the toughest seats in the executive table. A Chief Data Officer’s role is to create a system developed in a way that data can be leveraged across any business units within a company; from marketing to sales, to procurement, to finance. A CDO needs to empower all the users with trusted, clean, and ready-to-use data. They have to ensure that value can be extracted, and are hence outcome-focused. The role of a CDO is essential for the good management of the information assets a company has, as well as to improve efficiency in the data analyses to get a competitive advantage in their BI strategy. Gartner has implemented the CAO as the hot topic of their 2019 Summit in Orlando, hence the business intelligence market trends will incorporate this role as one that brings value and increased significance in business. Today, managers and workers need to interact differently as they face an always-more competitive environment. More and more, we see a new kind of business intelligence rising: the collaborative BI. It is a combination of collaboration tools, including social media and other 2.0 technologies, with online BI tools. This is developed in a context of enhanced collaboration addressing the new challenges the fast-track business provides, where more analyses are done and reports edited. When talking about collaborative BI, the term “self-service BI” quickly pops up in the sense that those self-service BI tools do not require an IT team to access, interpret and understand all the data. These BI tools make the sharing easier in generating automated reports that can be scheduled at specific times and to specific people. For instance; they enable you to set up business intelligence alerts, share public or embedded dashboards with a flexible level of interactivity. All these possibilities are accessible on all devices which enhances the decision-making and problem-solving processes. Collaborative information, information enhancement, and collaborative decision-making are the key focus of new BI tools. But collaborative BI does not only remain around some documents’ exchanges or updates. It has to track the various progress of meetings, calls, e-mails exchanges, and ideas collection. More recent insights, like the one from SelectHub, predict that collaborative business intelligence will become more connected to greater systems and larger sets of users. Team’s performance will be affected, and the decision-making process will thrive in this new concept. Let’s see how it will be developed in the business intelligence trends topics of 2019. Let’s now tackle the last of our BI and analytics trends 2018! Customer analytics and continuous experience will be one of the focus areas of business intelligence trends in 2019. Customer journey analytics, emotion detection, speech analytics, customer engagement center (CEC) interaction analytics, analytics for customer intelligence – a lot of analytics awaits service leaders to visualize and connect the consumer journey across multiple devices and channels. By predicting customer behavior, the use of data will become an essential part of the consumer experience and formula to success. 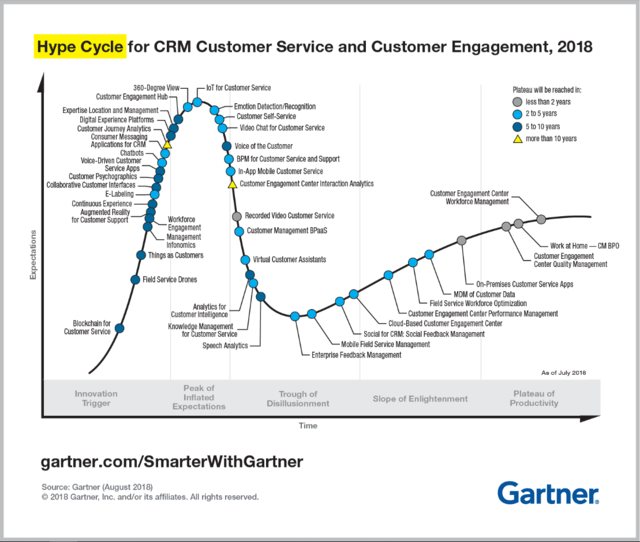 Gartner has developed a Hype Cycle to analyze the most critical technologies in the supporting customer process since many leaders will be looking to technology to deliver the desired CX (Customer Experience) to clients. Consumer expectations are rising. Therefore, supporting their requirements with the vast amount of data will be a demanding task. Analyzing and predicting their behavior will go hand in hand with data management, AI and RPA (Robotic Process Automation). Becoming more data-driven, using business analytics tools to utilize the most effective way of the decision-making process will become a prerequisite for the sustainable development of a company. Consumers will dictate this advancement so we will watch it as one of the important business intelligence trends in 2019. 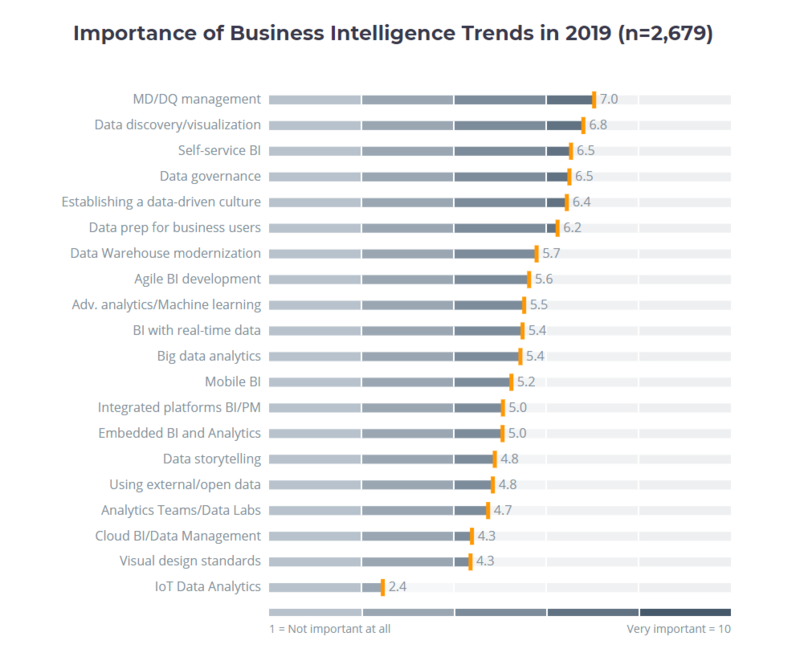 What Are The Analytics & Business Intelligence Trends For 2019? Being data-driven is no longer an ideal; it is an expectation in the modern business world. 2019 will be an exciting year of looking past all the hype and moving towards to extract the maximum value from state-of-the-art online reporting software. If you’re ready to start your business intelligence journey, or keep up with the 2019 trends, trying our software for a 14-day trial will do the trick! And it’s completely free!